The new Student Residence Hall at Benedictine University represents a major stage of growth in the University’s development. The 400 bed residence hall puts a stake in the ground as a new precedent of campus residential life, and initiates replacement of outdated buildings currently on campus. The future of campus residential life for Benedictine can continue in years to come as additional phases of the project are developed and constructed. Benedictine Underground, all contribute a variety of special amenities to the building for enhanced student experiences. Outdoor connections are paramount in the design, layout and positioning of the building on campus. Entry points into the building capture direct student paths to and from the campus quad. A courtyard at the main entrance captures retail activity and the dynamics of student flow and interaction through campus. A courtyard at the opposite side of the building achieves a sense of privacy, with a more intimate outdoor experience and setting. 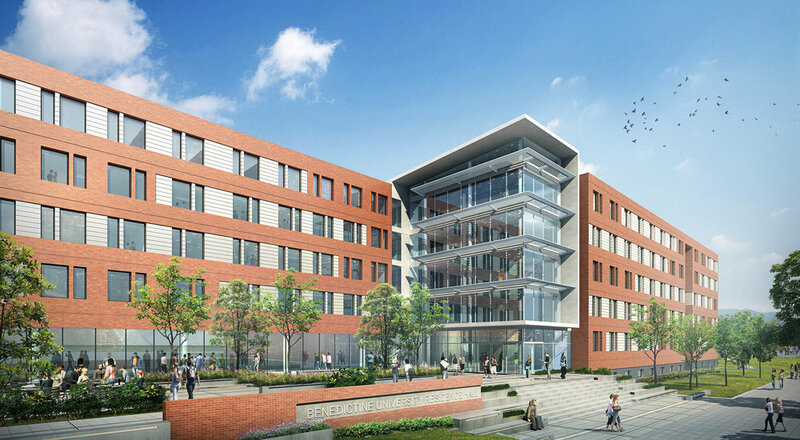 Additional green space surrounding the southern end of the building helps create a link to the existing Jaeger Hall, and promotes student interaction between residence halls.